Cleo is a happy, young and carefree Egyptian Princess. 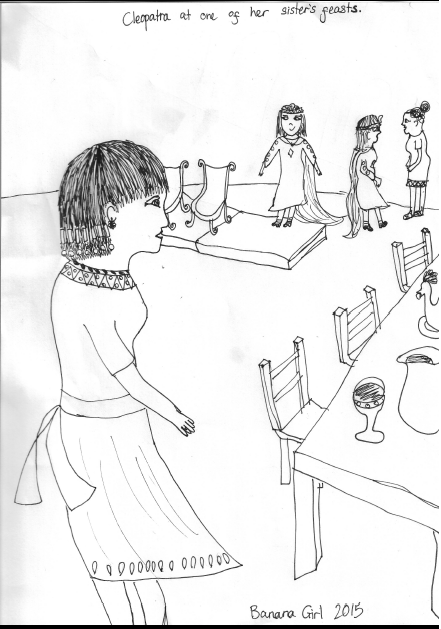 Suddenly her mother dies and Cleo is sure that her older “Evil Sow” half sisters,Tryphena and Berenice, killed her mother to become Pharoahs. Her dad is in exile in Rome. Her sisters worship Am-heh, the God of the Underworld and eater of souls. 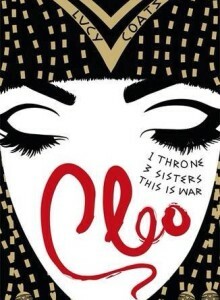 Cleo, because she is now next in line for the throne, is worried that they will kill her. So, she and her best friend, Charmion (“Charm”), flee from Alexandria to the Temple of Isis in Sais. Isis is the Goddess and Protector of Egypt. Cleo pretends she’s an ordinary girl and trains to become a Priestess of Isis. Isis summons Cleo to carry out a dangerous mission, back at the palace at Alexandria. If she fails, then Egypt will fall as all of the power of Ra (the God of Sun) and of the other upper Gods, including Isis will become the power of the Underworld Gods. Will she complete her mission? She only gets half-way through her mission, which adds to the suspense, at the end of the book!! Very little is known about Cleopatra’s early life, and although this story is unlikely to be true, I still think some of it is realistic and it sparks the imagination. I would like to say though, if you don’t like murder, then maybe this is not right for you as it has lots of murder and betrayal, although, there are quite gentle parts. The people in the story appear to find things out about themselves they never knew before – some times for the better, sometimes for the worst.